The Speaker of the House of Commons has used a speech at Westminster to highlight how the fight for equality has progressed in the UK during the reign of Queen Elizabeth II as she marked her Diamond Jubilee year in Parliament. John Bercow spoke in praise of progress that had been made in equality for people regardless of their gender, race or sexuality in the sixty hears since the Queen’s accession to the throne. He said: “This is a different Britain from 1952 but not one detached from then. We are in so many ways a much bigger, brighter and better United Kingdom. “This is a land where men and women today are equal under the law and where Your people are respected, regardless of how they live, how they look or how they love. This is a nation of many races, faiths and customs, now beginning to be reflected in Parliament. 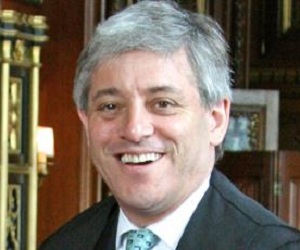 Many will have noticed the connection between Mr Bercow’s speech and the Kaleidoscope Trust, a charity of which he is president, which launched in 2011 and aims to equip LGBTI people around the world to fight oppression. Lance Price, Executive Director of the Kaleidoscope Trust, added that progress was still to be made in many parts of the Commonwealth, where 41 of the current member nations still criminalise homosexuality. He said: “John Bercow has once again demonstrated his commitment to upholding the human rights of lesbian and gay people. His choice of words today will not be lost of those of us who have admired his commitment to the values and objectives of the Kaleidoscope Trust since agreeing to be our President last September. Weeks after launching the Kaleidoscope Trust at Parliament, the Speaker unveiled his portrait and new coat of arms, which depicted rainbow flags and pink triangles around the words “All Are Equal”. Last year, Johann Hari and Elton John wrote about the charity: “A remarkable group called Kaleidoscope has been set up in London, with global reach and a simple goal. Any gay person running for her life, or any gay group banding together to be treated like a human being, will be given the support they need, in the way they want it.